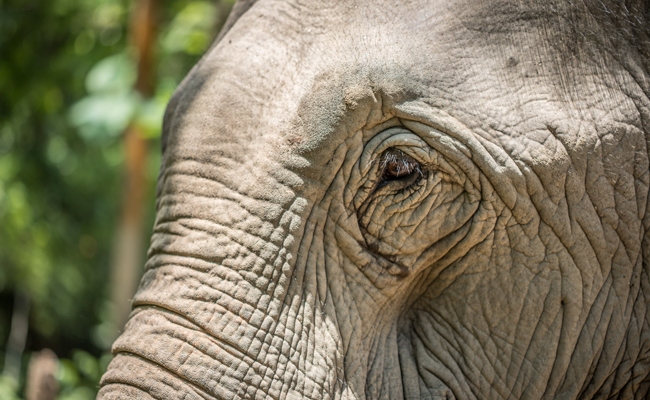 A New York court has issued the first-ever habeas corpus order on behalf of a captive elephant. If things go her way, Happy the elephant might just be the first nonhuman animal to gain legal personhood. The Nonhuman Rights Project is pursuing the order against the Bronx Zoo on behalf of Happy. A writ of habeas corpus requires that a detainee be brought before the court to determine if that person is being unlawfully held. To be successful, the court must decide whether Happy could legally be considered a “person.” If she can, think about what that will mean: Suddenly, in New York at least, all elephants might be persons under the law – and accordingly, may not be imprisoned in zoos. Happy, a wild-born 47-year-old Asian elephant, lives in isolation in a small section of the Bronx Zoo. She’s been at the zoo since 1977. Before that, she’d been an attraction at Florida’s Lion Country Safari. Happy lives separately from the zoo’s other elephants because they attacked and killed her longtime male companion, Grumpy, in 2002. In the winter, Happy lives in an inside cage that’s only about twice as big as she is. Year round, she’s all by herself. And many zoo attendees don’t even realize Happy’s there. [E]lephants are autonomous, self-aware individuals who empathize, engage in complex communication, problem-solve, and grieve. They require a vast amount of space in which to exercise their autonomy, to explore their worlds as members of multi-generational herds, and to make free choices about how to spend their days and live their profoundly complex emotional and social lives. At the Bronx Zoo, they are merely prisoners, forced to live in just a tiny fraction of the space a wild elephant would roam in a single day, while in the winter months, when the exhibit is closed to the public, they are kept in an indoor holding facility. You may remember Happy. She’s famous for demonstrating in a 2005 intelligence test that she could recognize herself in a mirror. She didn’t display social behavior indicating she thought she was facing another elephant. Rather, Happy’s movements demonstrated she understood she was looking at herself. That’s self-awareness — a rare and cognitively advanced ability in the animal world, so far demonstrated only by dolphins, some great apes and elephants. An animal so keenly aware of who she is, deprived of any companionship, cannot be living a worthwhile or truly happy life. The Nonhuman Rights Project wants to see Happy moved to an elephant sanctuary where she can mix and mingle with other elephants, with acres of land to roam freely. If a habeas corpus order urging animal personhood sounds familiar, you may be remembering NhRP’s other recent case pertaining to chimpanzees named Hercules and Leo. The court did not find those chimps had a legal right to personhood, but only because the judge felt constrained to that result due to previous case law. Even so, Hercules and Leo got their happy ending. They now reside at a chimp sanctuary. With any luck, Happy will get the same result, along with a decision that she’s a legal person. Cases like these recognize that the danger habeas corpus confronts—forceful but unjustified restraint and detention arguably in violation of applicable law—can exist even where the habeas petitioner does not resemble present-day rights holders. The question of Beulah, Minnie, and Karen’s legal personality is thus invariably entwined with the broader debate about the ‘rights’ of nonhuman animals and, about the ‘wrongs’ to which they should not be subjected by a decent society. A hearing is scheduled for December 14, 2018 in Albion, New York. The Orleans County Court will hear from both sides and ultimately determine whether Happy should be released from her confinement at the Bronx Zoo. “We think we have very powerful scientific facts and we have very powerful legal arguments, and by God, we’re going to keep making them because they’re going to prevail,” Nonhuman Rights Project founder and president, Steven M. Wise, told Fortune. Thank you, NhRP, for fighting this important legal battle. Good luck, Happy. People who care about you are trying to get you to a sanctuary, if our legal system will only recognize who you really are. Good luck Happy, my heart breaks for you! If only humans were evolved as some of the animals we terrorize, imprison, abuse and/or neglect, only then, could we truly become an evolved society. Everything crossed for Happy to be happy. Whether or not she's a person, she should not be kept in isolation. Cruel people! Good luck, Happy!!! Thank you, NRP!! !